Dhaka, 16 Nov, Abnews: A 500-year-old painting of Christ believed to have been painted by Leonardo da Vinci has been sold in New York for a record $450m (£341m). The painting is known as Salvator Mundi (Saviour of the World). It is the highest auction price for any work of art and brought cheers and applause at the packed Christie’s auction room. 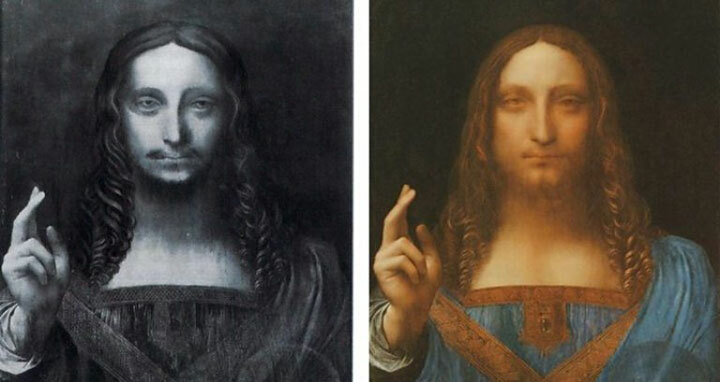 Just one is thought to be in private hands – the Salvator Mundi, believed to have been painted sometime after 1505. The final bid for the work was $400m, with fees bringing the full price up to $450.3m. The unidentified buyer was involved in a bidding contest, via telephone, that lasted nearly 20 minutes. The painting shows Christ with one hand raised, the other holding a glass sphere. In 1958 it was sold at auction in London for $60. By then the painting was generally reckoned to be the work of a follower of Leonardo and not the work of Leonardo himself. BBC arts correspondent Vincent Dowd says that even now, the attribution to Leonardo is not universally accepted. One critic even described the surface of the painting to be “inert, varnished, lurid, scrubbed over and repainted so many times that it looks simultaneously new and old”. “Any private collector who gets suckered into buying this picture and places it in their apartment or storage, it serves them right,” Jenny Saltz wrote on Vulture.com. But Christie’s insist the painting is authentic and billed it as “the greatest artistic rediscovery of the 20th century”. When in 2005 the Salvator Mundi re-emerged from obscurity, it created huge public interest as a “lost Leonardo”. Four years ago it was bought by a Russian collector for $127.5m (£98m) – but that was a private sale, not at auction. Christie’s in New York placed a starting bid of $100m at its auction of post-war and contemporary art.